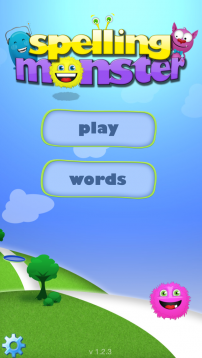 We updated the user interface throughout Spelling Monster, starting with our icon. It’s a little funner I think. Once you are in the app there are lots of great changes. We changed the home screen some but kept the simplicity. From the home screen you have three choices, add words, play games, or the new and improved parent gate. Though the home screen has a new look and feel it still functions the same. Just as before you will go to words name your list and enter your words, but you will notice a change here as well. You will notice a “Share Lists” and “Get Lists” button. This is for teachers and parents with multiple students. Teacher’s or parent’s can create a spelling list and share it with there students or multiple children. This feature does require an internet connection. No data is taken or recorded this is completely secure with its only purpose to share spelling lists. A simple rundown of how it works. After you list is created tap the “Share Lists” button. Have your students or children on their individual devices press “Get Lists“ and voila teachers have shared their spelling lists with their students. Now under our “Play” button. 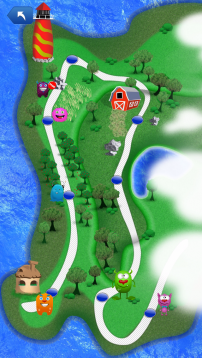 You will notice the map of Spelltopia has changed. Same fun games with a new feel. Follow the trail around and you will notice a new game, Lighthouse Letters and monster named Trapper. We have new pause and end screens. Now on to our “Parent Gate”. To access parent area simply press the gear down for three seconds. Behind the parent gate parents will be able to access their children’s stats. No changes in statistics. You will also be able to access “Settings” here. Settings is where you are able to choose game difficulty, and upper and lowercase. Also under the parent gate section you will find the”About Us”, “Feedback”, and “Rate The App”. Nothing has changed in these areas other than putting them behind the parent gate. We also have a few bug fixes in this update. For our Android devices we fixed the back button misunderstanding. So now hitting your on device back button won’t exit you out of the app. An on all platforms we are fairly certain we fixed the issue that only some devices seemed to experience with not being able to select a list after a certain number of lists were entered. Honestly this bug has been a huge challenge. There was no rhyme or reason this was happening and it wasn’t happening on every device but its randomness was happening across multiple platforms. We had one IOS user, two Kindle users, and one Android user contact us, I can only imagine how many didn’t. Please contact us we can’t try and fix what we aren’t told about. We already have things in place to begin working on our next update. Some buzz on the next update? A voice feature with practice test by popular request. Thank you to all of our users that give us constructive criticism. Also a new monster and game will be added to Spelltopia’s map. We hope your kids enjoy this update as much as our kids.